The Cypriot capital of Nicosia is literally a tale of two halves. 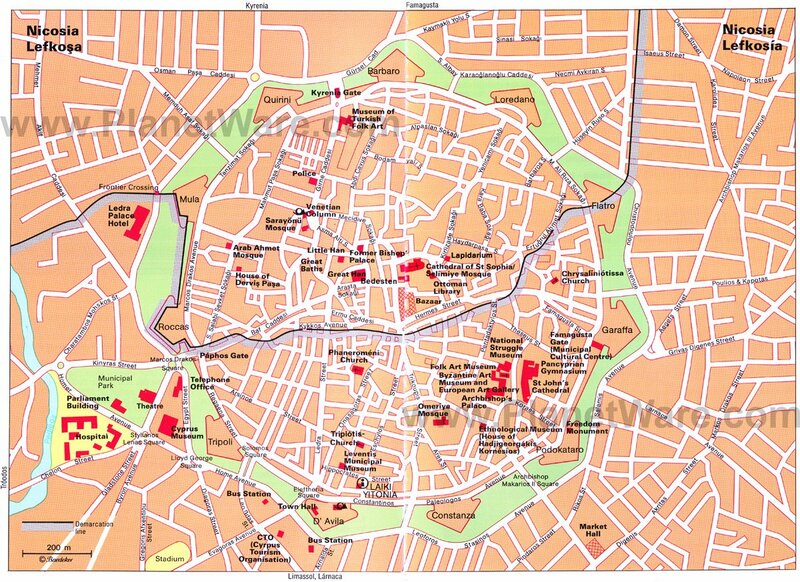 South Nicosia (also called Lefkosia) belongs to the Greek Republic of Cyprus, while North Nicosia (also known as Lefkoşa) has been part of the Turkish Republic of Northern Cyprus (TRNC) since the Turkish occupation of 1974. Since 2003 though, things have loosened up considerably, and popping over to Northern Cyprus and back again requires just a quick flash of your passport as you stroll through the Ledra Street border crossing that divides the old city district in two. This means Nicosia is a fantastic base for discovering the historic sites to the north of the city, including the fairytale castle of St. Hilarion and the extensive ruins of Ancient Salamis. The wonderful Cyprus Museum should be on every visitor's hit list. This exceedingly well-thought-out museum traces the history of the island with an extensive collection of artifacts that date from the Neolithic period to the Byzantine era. Room One contains excavated finds from the Neolithic age including a large number of Steatite idols. Room Two covers the Bronze Age, with many vases and jugs decorated with rather endearing animals, and Mycenaean artifacts from Ancient Kourion are displayed in Room Three. Room Four is home to the museum's highlight: a collection of votive figures (including Minotaurs, warriors, and charioteers) from 7-6 BC, found at Ayia Irini, near Morphou. Rooms Five and Six are sculpture galleries with artifacts from a wide range of periods. Room Seven contains a limestone female statue from Soli and a huge bronze statue of the Emperor Septimus Severus, while Room Eight displays bronze tools and assorted weaponry as well as some statues of gods. The tiny stone seals are interesting as are the Egyptian amulets and the green-horned god from Engomi. Room Nine has representations of rock-cut tombs (2500 BC - 400 BC) along with the objects found in them. Room 10 has votive inscriptions and other artifacts from tombs, while Room 13 has marble statues from Salamis. Room 14 contains terracotta figurines and leads back to the entrance. 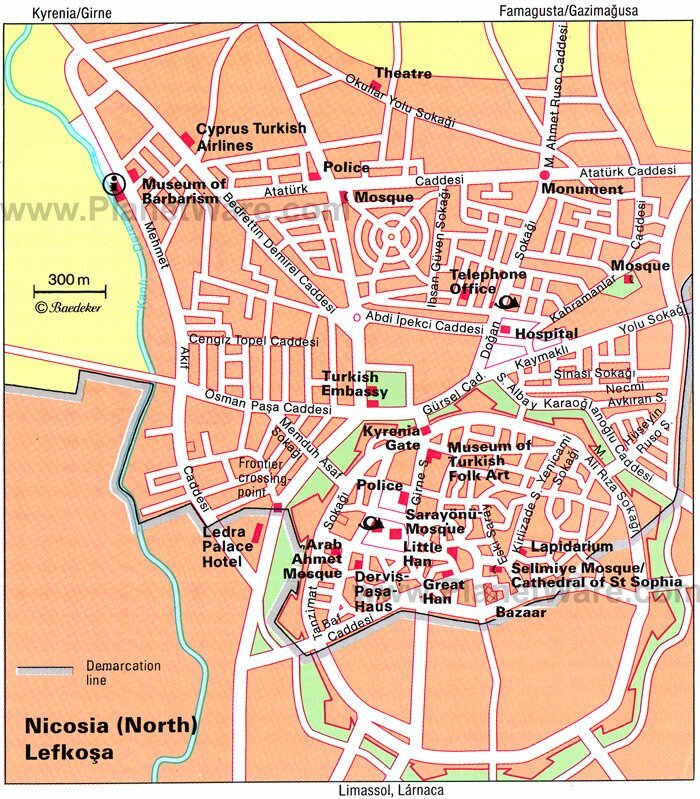 Nicosia's most defining features are its impressive Venetian walls, which encircle the old city. Although crumbling significantly, much of their original three-kilometer length is still in place. Famagusta Gate is the best preserved and is decorated with numerous coats of arms. The passage here leads out from the old city to the old city's empty moat area. Paphos Gate and the Roccas Bastion beside it are more interesting for their role in modern history. Here the UN Buffer Zone between the Republic of Cyprus and North Cyprus dwindles to less than 200 meters and until 2003, this was the only place on the island where Greek Cypriots and Turkish Cypriots could get close up. Today, flags for all four countries in the unresolved dispute (Greece, the Republic of Cyprus, Turkey, and North Cyprus) flutter in the breeze as a reminder of this island's woes. This han (a caravanserai) was constructed in 1572 and is an excellently preserved example of the architecture of that period. Hans were used as accommodation and storage places for merchants as they passed through town, often including stabling facilities for their horses (or camels) and sometimes recreation facilities such as restaurants and hamams (Turkish baths) as well. The Büyük Han has been painstakingly restored to its former glory, with the former sleeping quarters now home to a variety of shops, cafés, and local artisan ateliers, perfect for a spot of shopping to break up your old city sightseeing. It's in North Nicosia, just a short stroll from the Ledra Street pedestrian border crossing. For anyone interested in Cypriot religious artwork, the Byzantine Museum contained within the Makarios Cultural Foundation is an important stop in the city. Here, you'll find a staggering collection (220 pieces) of Christian icons that range in age from the beginning of the Byzantine era up until the 19th century. For many people with a special interest in this artwork though, the highlight of the museum is the Kanakaria Mosaics on display. After the 1974 Turkish occupation, these highly-priced pieces of art were stolen from a church in North Cyprus' Karpaz Peninsula, and in a story that could have been ripped straight from an art world thriller novel, involving dodgy art dealers and an Interpol sting operation, were returned to the Republic of Cyprus in 1991. 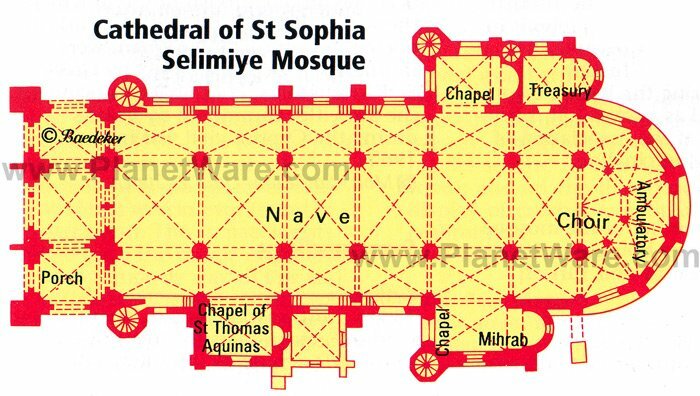 The most recognisable landmark in North Nicosia, the Selimiye Mosque began life as the Church of Agia Sofia and was finished after a 78-year construction process in 1326. It has been a mosque since the 16th century, when the Ottomans took control of the island. This merging of elaborate medieval church design and the simplicity of mosque design has created a fascinating space with the soaring interior of this typically Gothic structure having been whitewashed and any icon details long taken away. If you'd like to enter, bring a headscarf (for females) and dress modestly (no shorts or shoulderless tops). The mosque is a five-minute walk from the Ledra Street border crossing. Recently renovated, Nicosia's Leventis Museum is housed in a beautiful old city mansion and presents the history of Nicosia through a carefully selected collection of ethnographical displays and artifacts. For history lovers, this is not to be missed, and the museum has won European Museum of the Year for its brilliantly curated exhibits that trace the city's long and eventful past. Among the displays, you'll find items dating from 2300 BC right up to the Ottoman and colonial era with some of the most fascinating exhibits being the wonderful traditional costumes on show. The museum also helps you understand the impact of British rule on Cyprus and the city's modern history with the island's division in 1974. Just wandering around Nicosia's old town is a pleasure. Ledra Street is the main drag through the old town and is lined with cafés, restaurants, and shops, leading right up to the Ledra Street border post to North Nicosia. Skirt off Ledra Street into the tumble of alleyways to check out the Ottoman mansion architecture of the House of Hatzigeorgakis Kornesios (20 Patriachou Grigoriou Street), who was the island's dragoman during the late 18th century; the Omeriye Mosque (Trikoupi Street), which has a 14th-century Lusignan entranceway; and the Panagia Chrysaliniotissa (Archiepiskopou Filotheou Street), considered the oldest church in Nicosia and believed to have been built in 1450. Then cross into North Nicosia to continue your old town tour, making sure to visit the Bedesten (Arasta Sokak), which first served as the Church of St. Nicholas of the English and then became a market in the Ottoman era; the Mevlevi Museum (Girne Caddesi), which offers a series of well-thought-out exhibits on the whirling dervish Sufi order; and the Dervish Pasha Museum (Beliǧ Paşa Sokak) for its interesting ethnographical displays of Ottoman life. Just west of Nicosia is the Mesaoria region, scattered with tiny villages and ancient monasteries. If you've got your own transport, it's a great day out from the city. Of the villages here, Peristerona (30 kilometers west from Nicosia) is a quaint place, which deserves a visit for its 10th-century five-domed Church of St. Barnabas and Hilarion, which towers over the surrounding traditional stone houses. Inside, the church contains important and well-preserved 16th-century icon paintings depicting the presentation of Christ. Head south from here to visit Maheras Monastery, sitting in splendid isolation on a craggy hill. Then head northeast for a trip to the Monastery of Agios Irakleidios and the archaeological site of Ancient Tamassos, an old copper-working town that dates back to the 6th century BC, both near the village of Pera. One of the island's most famous tourist attractions - thanks to writer Lawrence Durrell - Bellapais is a wonderfully old-fashioned village of humble whitewashed cottages that sprawl down the hillside ending at the evocative ruins of Bellapais Abbey below. English author Lawrence Durrell wrote the book Bitter Lemons of Cyprus while living here, immortalising Cypriot village life at the end of the British colonial period. Although the village is incredibly picturesque itself, the main sight is Bellapais Abbey, an old Augustinian monastery full of intricately carved arches and cypress trees surrounding its cloister. There are panoramic views across North Cyprus' coastline from the refectory roof. There's no public transport to Bellapais, but you can hop on one of the frequent minibuses from North Nicosia heading to Kyrenia and then take a short taxi ride to the village from there. The atmospheric harbor town of Kyrenia (also known as Girne) is North Cyprus' vibrant seaside hub. The small harbor is overlooked by a grand Byzantine era castle and backed by an old town district of tangled alleyways and Ottoman period houses that are fun to explore. Visit the castle first with its Shipwreck Museum, and then stroll harbor-side to see the Folk Art Museum in a restored carob warehouse. Then wind through the narrow lanes to the Church of Archangel Michael (Cambulat Caddesi), with its collection of religious icons that come from churches across North Cyprus. Frequent minibuses run from North Nicosia to Kyrenia. St. Hilarion Castle looks like it fell straight off the pages of a storybook. With its ramparts climbing up the jagged hilltop, this is the epitome of a fairytale castle (and it's said the castle in Disney's Snow White is based on St. Hilarion). Built in the 10th century by the Byzantines, the castle sits in a lofty position that has been a strategic asset right up to the modern era. Follow the path (wear good walking shoes) from the lower enceinte, where the garrison were housed, up to the middle enceinte, with its church and barrack rooms, and then climb higher to the upper enceinte, with a tower and royal apartments. From here, a series of staircases lead you to Prince John's Tower, with amazing views across the countryside. St. Hilarion Castle is best visited with your own transport as there's no public transport to the site. Famagusta (also called Gazimaǧusa), riddled with crumbling Gothic buildings, is the most beautifully evocative town on the island, its bloody history of siege and capture only adding to the old town's atmosphere of long-past glory today. Ringed by a mighty border of Venetian fortifications, the old town is stuffed full of golden-stone ruins of basilicas and remnants of palaces that sit incongruously between rows of dilapidated houses. Right at the center is the glorious Lala Mustafa Pasha Mosque (Main Square), which was once the Cathedral of Agios Nikolaos and is a beautifully-preserved example of Gothic architecture. Nearby are the roofless ruins of St. George of the Greek Church (İstiklal Caddesi), where faint traces of frescoes still remain on the apse. On a grassy bank just inside the city walls are the haunting remnants of St. Mary Church and the Carmelite Church (Server Sokak). From here, climb up onto the Pulacazara Bastion of the walls to walk along them for commanding views across the town. There are regular minibuses from North Nicosia to Famagusta. Along with Ancient Kourion, Ancient Salamis is Cyprus' most important ancient-kingdom archaeological site, with a wealth of ruins to explore. The gymnasium and baths complex, with its fine statuary and grandly columned courtyard, is the main attraction, but further into the sprawling site are vast remnants of two basilicas, an agora, and a huge reservoir complex. Nearly all the remains date from the city's Graeco-Roman and Byzantine eras, but Salamis' history stretches much further back. It's said to have been founded just after the Trojan War and has been variously under Assyrian, Persian, Greek-Ptolemaic, Roman, Byzantine, and Arab command, which mirrors the island's own classical history. There's no public transport to the site, so it's easiest seen with your own wheels, or you could catch a minibus from North Nicosia to Famagusta and hire a taxi for the short ride to the site. Less visited than St. Hilarion Castle and more dilapidated, Buffavento Castle is a windy, rugged outpost of a ruin atop a craggy mountain summit to the east of Kyrenia. The ruins here are not extensive but they lie in a picturesque location, towering over the forested slopes below. Hike from the lower enceinte to the upper enceinte for the best views across the coast. Buffavento is thought to have been built during the Byzantine era, and Crusader Richard the Lionheart once took ownership of it. Strategically, it played an important role in guarding the coastline along with St. Hilarion to the west. There is no public transport to the castle, and it's best visited with your own transport as part of a day trip including St. Hilarion. Hilton Cyprus: 5-star luxury, spacious rooms, excellent breakfast, indoor pool, health club. The Sandstone: mid-range bed-and-breakfast, heart of the old town, welcoming owner, delicious breakfast. Centrum Hotel: 3-star hotel, old town location, air-conditioned rooms, tea and coffee-making facilities. Asty Hotel: budget hotel, family-run, home away from home, free city shuttle, mini-golf and fitness center, complimentary use of bikes.